I never thought about using cantaloupe in baking before until I found this recipe for Cantaloupe Bread. It looked good and I love pecans so I decided to make it. The recipe makes two loaves and is easy to do. I gave one loaf to my neighbor and it was a hit. 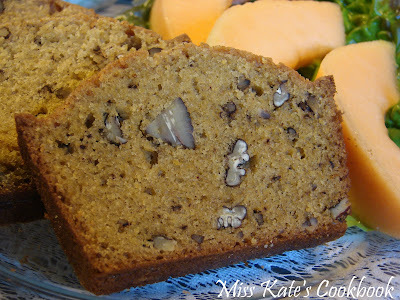 I almost think I like this better than Banana Bread. Try this I think you will really like it. You can freeze cantaloupe puree to make in off season also. Preheat oven to 325F (160C). Grease two 9x5x3-inch loaf pan. In large bowl combine the flour, salt, baking soda, baking powder, cinnamon, ginger and nuts. In another large bowl beat the eggs until light and frothy. Add the oil, sugar and vanilla, mixing well. Cut the rind from cantaloupe; and cut the melon into 2-inch chunks. Puree in blender or food processor until smooth. Measure 2 cups puree and add to the egg/oil mixture. 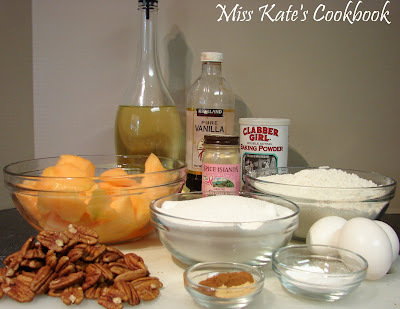 Add the flour mixture to the cantaloupe mixture and stir until just combined. Do not over mix. Spoon into the prepared pan and bake for 1 hour, or until it tests done. Allow to stand for 10 minutes before removing from the pan. Cool on a wire rack. Kudos to you trying something unique! I have had a recipe for this but I have not had much confidence in it to bake. Glad you tested this recipe out-I have bookmarked. Thanks for sharing. Thanks very much. Just had a piece with a cup of tea.